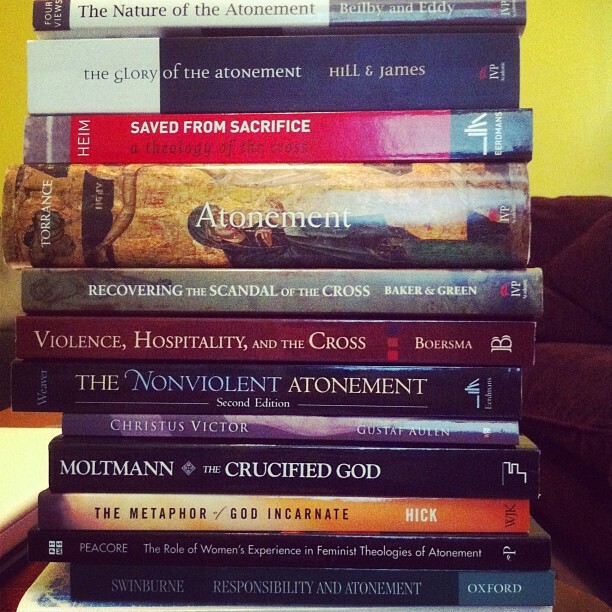 1) I am struck by how important the doctrine of atonement is to the Christian faith. It lies at the very heart of the gospel. Emil Brunner went so far as to say that atonement “is the Christian religion itself; it is the main point; it is not something alongside the center; it is the substance and kernel, not the husk” (quoted in The Glory of the Atonement, ed. Hill and James [IVP 2004], 18-19). Or as Gustav Aulen put it (whose 1931 Christus Victor I am reading now), “each and every interpretation of the Atonement is most closely connected with some conception of the essential meaning of Christianity, and reflects some conception of the Divine nature” (Christus Victor, Wipf and Stock, 2003, 12-13). In other words, how one understands atonement reflects how one understands God, and how one understands Christianity. To miss atonement is to miss at the center, not at the fringes. This is a doctrine that is worth serious study and prayer. 2) It seems to me that any adequate theory of Christ’s atonement must account for its close relationship with Christ’s incarnation, earthly life, and resurrection. To interpret the atonement apart from these points of historical context would be like interpreting the climax of a novel apart from its plot and conclusion. In addition, it seems to me that any adequate theory of atonement must be able to account for the brutal nature of Christ’s death. Why a cross? Why could Christ not simply have been hung, or beheaded? Also, why death on a cross? Why could Christ not simply have hung for several hours on the cross, and then immediately received glorification without dying? The meaning of atonement must be connected with its nature, and context. It seems to me that many of the so-called “subjective” views of atonement, especially the moral influence view, fail to explain why such extreme suffering was necessary. To a lesser degree, I think this is true of the mystical view, the healing view, the vicarious repentance view (AKA non-penal substitution), and some versions of the Christus Victor view. I don’t think the governmental view (AKA penal non-substitution) necessarily fails on this account, but I think it has other difficulties. On the other hand, when the meaning of the atonement is reduced to penal substitution, the life and resurrection of Christ can be marginalized in their importance. More on this below. 3) I think it its important to recognize that any adequate theory of atonement must be able to account for not only the New Testament teaching about the meaning of Christ’s death, but the Old Testament types and shadows that prepared for it. I think one good litmus test for any theory of atonement is, “how does it square with Leviticus 16?” Its not enough to cohere with biblical assertions; a good theory must explain the biblical narrative. Again, I think many of the “subjective” views of atonement struggle on this point. 4) Sometimes theories of the atonement are rejected for their offensiveness, but no theory of Christ’s atoning death can ever be as offensive as its facthood. The thought of God incarnate crucified is already infinitely offensive to human reason, pride, and expectation. Why should the meaning of an event be calm and easy when the event itself is unthinkable, utterly unimaginable? The thought of God crucified, the Creator hanging helplessly – this would be blasphemous if it were not true. There is no sense seeking politeness here. We must be humble and willing to be taught and corrected. The death of Christ is like a wild animal which can save us, but not be tamed by us. 5) Thus far I am finding many of the criticisms against a penal substitionary model of atonement (hereafter PSA, for penal substitionary atonement) to be lacking. Some criticisms of PSA engage in reckless caricaturing. Others are only criticisms of PSA being presented the exclusive meaning of atonement, and yet present themselves as criticisms of PSA itself. Others critique things that often but not necessarily go along with PSA, and then act if PSA itself is weakened by this criticism. I think Joel Green does this in Recovering the Scandal of the Cross (IVP Academic, 2000), 49ff. While I agree with Green that the meaning of the atonement is multi-faceted, it seems to me that he (perhaps inadvertently) downplays PSA. In addition, it seems to me that many of the reactions against PSA are rooted in a prior and more basic error of downplaying God’s wrath against evil, and also of downplaying the legal, judicial element in our relationship with God. Certainly we all recoil at caricatures of an angry God, and certainly the judicial element of our salvation can be over-played. But ultimately I think aspersions about active divine wrath and divine retributive justice lose their force when seen in light of truly heinous evil. A God who did not have active wrath and execute retributive justice against child molestation or Nazi extermination devices is not a God I could worship. A bloody atonement is not offensive to the person who is victimized by great evil, or the person who is grieving great injustice. 6) Nevertheless, while I hold to the broad contours of a penal substitutionary model, I do not think this view exhausts the meaning of the atonement. Christ endures and exhausts the wrath of the God for the sin of the elect while he hangs on the cross; but this is not all he does. He also, in submitting to the whole curse of sin and guilt and death, enters into the full orb of fallen human experience, including anxiety, abandonment, despair, and death. All of his penalty is substitutionary, but not all of his substitution is penal: he suffers more, but not less, than the wrath of God on our behalf. Moreover, there is a broader redemptive-historical dimension to the cross: at the cross, good conquers evil. It is the ultimate example of God using evil for good (Genesis 50:20, Acts 2:23). It is the paradigmatic expression of suffering unto glory (Hebrews 12:2). It is God’s “checkmate” to Satan (Colossians 2:15). I see substitutionary dimension to atonement as the basic DNA that runs through everything, but I think this broader theme of triumph over evil is an important corollary that fits in together with it. At the cross, Christ cancels guilt, and He conquers evil; He assuages God’s justice, and He anchors our hope. 7) Aulen’s book, being a historical study, raises the historical question. How has the church understood the meaning of the atonement through the centuries, and how should this shape our thinking today? It is commonplace to acknowledge that the early church focused on Christ’s person rather than his work, but obviously there were common understandings of his work that were not defended or worked out in detail precisely because they went un-challenged. I do not agree with all aspects of Aulen’s historical portrait, especially with respect to his interpretation of Luther. But I think he has a point that in general, the first 1,000 years of church history point in the direction of a broader atonement model, focused on the defeat of death as well as the cancelling of guilt, and with Satan in view as well as God. The doctrine of the atonement will thus be a watershed issue for my broader question during my PhD studies of how Protestant identity relates to pre-Reformation church history. You have inspired me to pick up Torrance’s book, Gav. Thanks for that. Please let me know what you think of it!! I have just been Reading the latest book against penal substitution, Atonement, Justice and Peace, by Belousek (a lot bigger than Joel and Mark Baker and Denny Weaver and the others) Belousek sure has a lot of false dichotomies. Like, if love, then not propitiation. If God is the Subject, then God can’t be the Object also. In other words, not a lot of empathy with his opponents. Name one writer defending penal substitution who denies that it’s God’s love. But since Belousek doesn’t think it can be both, then he acts as if they don’t think it’s both. p 256–“the scapegoat is exiled alive. In the day of atonement ritual, the sin-bearer is not a sacrifice, and the sacrifice is not a sin-bearer. Thus there is no connection between the scapegoat and the blood sprinkled…” No connection between the two goats? The guy does a lot of false either-or’s, and yet talks about “options” among “orthodox” ways to read the text. I don’t want to equate my reading of the text with the text. But I am left wondering if Belousek ever talks to anybody who doesn’t believe what he believes.